There are stores that I visit any time I am shopping for special people. My wife and I are lucky in that we share the same taste in furnishings, so if I like something it is a safe bet that she will also appreciate my selection. Here’s some ideas that can save you money and keep you out of the malls and away from the crowds. If you are decorating your log home and want to surprise your family with a unique furniture piece or rustic decor accents, I’d recommend that you spend some time browsing Black Forest Decor and get $25 off on orders over $199.99 – Use coupon Code mdc25 . Kids of any age (that would include us) can have a ball building log homes with the original Lincoln Logs. If you owned a set of these logs as a child you never forget the hours of fun creating houses, forts and towns for your imaginary little friends. 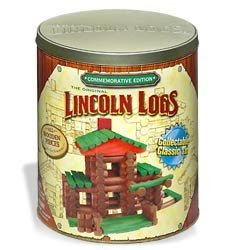 A truly unique gift for a little person in your life would be this “Lincoln Logs Commemorative Tin” … but remember that you’ll have to share it with the kids eventually. If you have a family member or friend who is the ‘techie type’, they like things they can use… forget toiletries, clothing or other such mundane items. Hi-tech gadgets, software or services will light up their faces. One online service I can’t recommend more highly is Mozy Unlimited Backup. I use this myself and last year I survived a total hard-drive meltdown because I had Mozy installed (This is one gift I’d buy for myself). There are some people you just can’t choose a gift for no matter how hard you try. Or, you have family and friends scattered across the country and shopping and shipping are always a hassle. Here’s an idea that can fit almost anyone on your gift list… and they do all the hard work, too! PPS: Don’t forget our directory for gift ideas. You can find a great selection of log home books, tools like tenon cutters and hand tools or fireplace accessories. Hey David, I love the “Pet Log Chip” and apparently so do others who have taken the time to submit pics of their ‘Pet’. Great new twist on an interesting idea. Merry Christmas!